EFF student Aseza Mayaphi wearing an SANDF uniform. A member of the Economic Freedom Fighters (EFF) is due to appear in court on 24 January for illegally wearing a South African National Defence Force (SANDF) uniform. The SANDF said that the South African Military Police Agency recently arrested and handed over to law enforcement agencies a 20-year-old Western Cape man allegedly seen on national television wearing an item of the uniform of the constitutional armed forces of the Republic of South Africa without authorisation. The arrested person was released on a warning to appear before the Bellville Magistrate Court on 24 January. 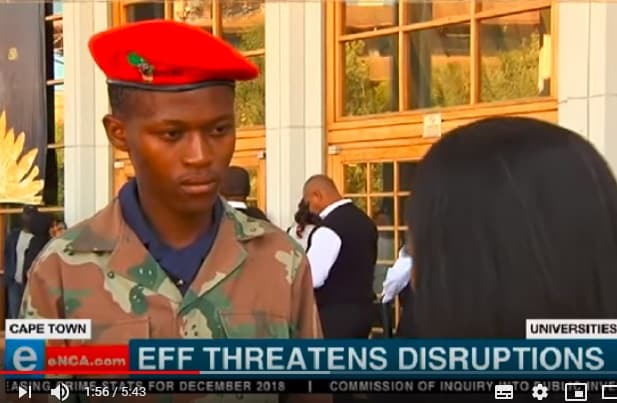 Aseza Mayaphi, the EFF student command secretary at the University of the Western Cape, was interviewed by eNCA wearing a camouflage battle smock and red beret. He was talking about the EFF’s “Sizofunda ngenkani” campaign that aims to ensure students have access to tertiary institutions. In a statement, Brigadier General Mafi Mgobozi, Director Defence Corporate Communication, said that SANDF uniforms and related items are registered for use solely by regular force, reserve force and honorary members of the SANDF in execution of their duties as stipulated in the SA Constitution and civilians/non-members of the country’s military are prohibited by law to wear such uniforms. Mgobozi urged South Africans to report all sightings of illegal wearing of the military uniform to law enforcement officials who will act and apprehend such persons. “This is a standing practice and a measure to prevent unauthorized persons from wearing these uniforms, and commit heinous crimes that endanger the livelihood and lives of the people of South Africa and bring the good name of our security forces into disrepute,” Mgobozi concluded.